In collaboration with the Department of Surgery at Western Health, the Western Surgical Students’ Society of Melbourne held a hugely successful ‘Surgical Career’s Evening’ on the 15th of October at Sunshine Hospital. This event brought together junior medical staff and medical students from all year levels from all clinical sites with a keen interest in developing a surgical career. The attendees were taken on a journey of surgery from the early stages of being a surgical intern to the pinnacle stages of being a consultant. The panel of speakers with a diversity of experiences was the highlight of the event. The evening was preceded by a talk by Associate Professor Stephen Lew (Clinical Dean of Western Clinical School) who provided his own take on how to kick start one’s surgical career from medical school. This was followed by Dr. Samantha Pellegrino (HMO 3) talking about getting the most out of internship and HMO years to get a head start in surgery. Dr. Nicole Tham (SET registrar) also shared her experience on how she juggled home life with a busy specialty training program while Dr. Su Mei Hoh (Surgical Fellow) highlighted the pathways and opportunities one could pursue following completion of the specialty training program. 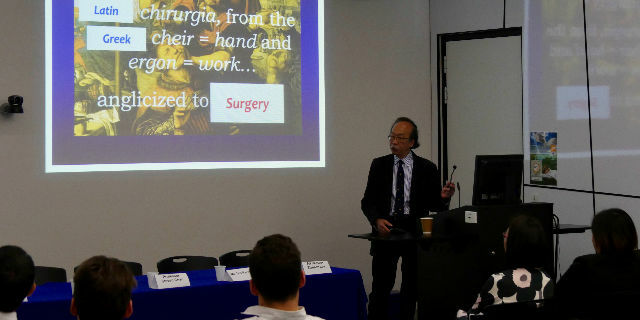 Associate Professor Justin Yeung and Professor Steven Chan, shared with the audience their thoughts on what it is like being a consultant surgeon as well as a brief history on the changes in surgery and the prediction of where the future of surgery is heading. The evening concluded with a summary and Q&A session with Mr. Ian Faragher, where many inquisitive questions were raised and addressed by the panel of speakers. The feedback from this event was extremely positive as it satisfied the audiences’ curiosity about surgery and left them filled with inspiration and anticipation of what the future would hold for surgery.